My cousin decided to call me yesterday and tell me that she's flying in for the weekend, and that we're going to a music festival. Haha, so anyways, that's what I'm doing for the weekend. Despite the fact that the hurricane is causing high winds and colder temperatures, I'm excited. I just hope that her flight gets in on time and isn't delayed because of the wind. Anyways, I've been trying to stock up on food for her arrival. She loves Spaghettio's, hence the last post's recipe. I also bought veggie dogs because she's like...obsessed with them, and I'm dragging her to my school's Halloween party tonight. I'm being a leopard, but I don't think that she even has a costume. Serves her right for spontaneously booking a flight down here on the weekend before Halloween in the middle of a hurricane. I really do love her ridiculous soul unconditionally though. Pictures to follow! Oh, as far as the recipe goes, this is perfect for Thanksgiving or any chilly fall day. It's sweet, savory, and just plain amazing. I bought a package of farro from Target that cooks in the microwave in 90 seconds, so this took me less time. 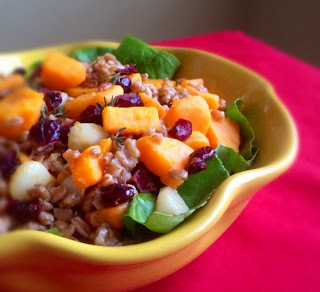 I can never find regular farro, and I don't know exactly how long it takes to cook, so this may take you longer that 20 minutes if you're not using the kind that I used. 1. Cook the farro, add the olive oil and 1/4 tsp. salt. Toss to coat and set aside. 2. In a medium saucepan, add the sweet potatoes, garlic, and a few cups of water. Bring to a boil, and boil until the sweet potatoes are tender, about 12 minutes or so. Drain and return to pan. Add the agave and remaining salt. Toss to coat. 3. 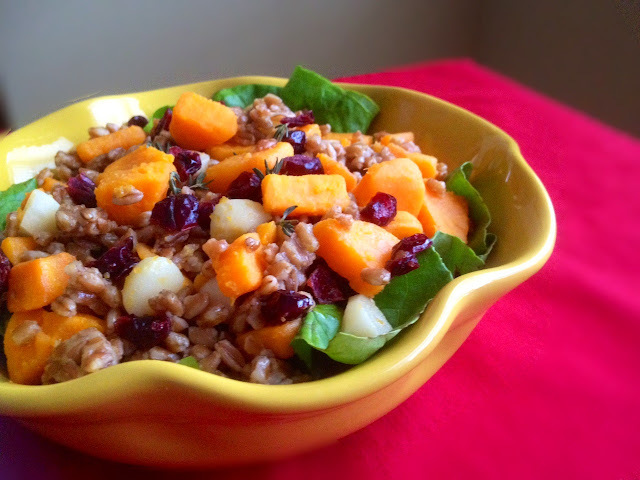 Add the cranberries, sweet potatoes, and garlic to the farro and mix together. Sprinkle the thyme on top, and serve over a bed of Boston lettuce or arugula.